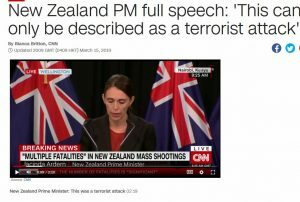 Last Friday 15, in the early afternoon, what is now believed to be a sole gunman committed a preplanned terrorist attack on the Al Noor and Linwood mosques in my home city of Christchurch. Currently, the death toll stands at 50, with a further 50 suffering injuries that range from critical to minor. The dead include men, women, and children as young as three years old. 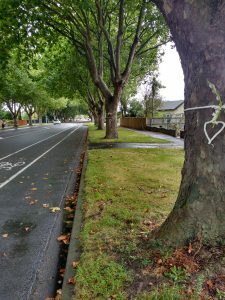 As I write this, a four-year-old girl is still fighting for her life in Auckland’s Starship Children’s Hospital and I understand that at least two others also remain in critical condition. 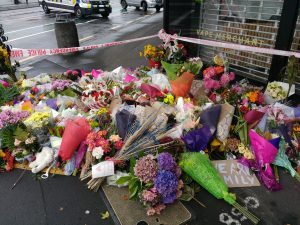 I also want to express my support for New Zealand’s leaders, who have united in rejecting this terrorist act and in support for the communities of the Al Noor and Linwood mosques, in particular, but also New Zealand’s wider Muslim community. 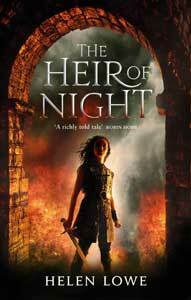 In terms of a personal response, initially I did not want to post at all. I questioned what I, as an individual citizen on the suburban backlines, could say that would be meaningful in the face of such an atrocity. I certainly don’t feel that I can cap or expand on Jacinda Ardern’s words and I know that nothing I say will in any way lesson the wound that has been torn in one of our communities, or ease the grief and turmoil of the survivors, their families and friends, and extended community. And I also feel, very strongly, that this isn’t about me or my “feelings”. It’s really important that the focus stays on the dead, the wounded, the survivors, the families, and the savagery of this attack on NZ’s Muslim community. Yet I also believe that giving into that response of “not wanting to” would be an act of cowardice on my part. The nature of terror is to target the innocent and those who do not bear arms, to sow doubt and confusion and fear, and to try and lessen the everyday bonds that knit communities together. Under any circumstances, citizenship is not a spectator sport; it requires commitment of us all, whether the Prime Minister, first responders, and medical professionals on the front lines, or a “just-a-person” Helen on the suburban rear lines. At present, there may not be a great deal that I can do, in real and practical terms, to honour and fulfil the commitments of citizenship and awhi (support) Christchurch’s Muslim community. But what I can do is to stand up and be counted in terms of saying that I do utterly reject this act and the ideology that has spawned it. I can also consciously think about and strive to empathize with those affected, to “walk-in-the-shoes” of their terror and trauma, devastation, loss and grief. To try and feel their pain as my pain, to make it true and real that rather than “them and us”, in our community there is only Us. In terms of tangible actions, my partner and I have donated money to support the victims and the community. 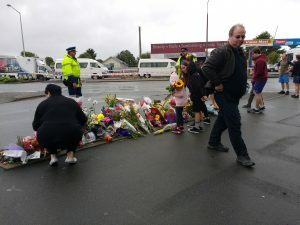 We have also, like so many others, taken flowers (from our garden) to leave at the police cordons, which is as close as we can get to the Al Noor and Linwood mosques. 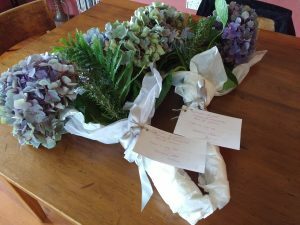 The flowers were chosen with regard for the language of flowers: hydrangea for sincere emotion, in this case grief; rosemary, for remembrance; and fern for its NZ meaning of the hope of renewal, as well as the more general meaning of sincerity. The rest of the message was aspirational: There is only Us. And Arohanui, an expression of “great love.” Because we have no white flowers for mourning, each arrangement was wrapped in white paper and tied with a silver ribbon. Intellectually, I know that this gesture, too, does nothing for the dead and little to help the injured of the two mosque communities or those who now mourn for loved ones. I also know that those whom the flowers and messages are intended to support may never see or read them, since their focus is—necessarily—on the harsh realities of identifying and burying the dead, keeping vigil for the wounded, and supporting those who mourn. Nonetheless, it still felt—and feels—really important to reach out publicly, to express solidarity and support the bonds of community, and to repudiate this act of barbarity, hatred, and violence. In that sense, the message of the flowers and going to the cordons is also for the perpetrator and those who propagate extremism: in this case white supremacists and Islamophobia. In writing this, I also acknowledge that although now is primarily a time for grief, we must already be thinking about what we must do in the future to give effect to that repudiation and to promote healing and peace and inclusion. This means addressing, as communities and a nation, the very real issues raised by the Islamic Women’s Council. I believe we also need to articulate and understand that grief and trauma are not limited to a particular time and incident, then neatly and tidily over with and done. 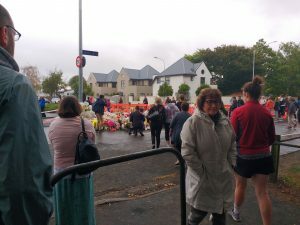 As Christchurch has most recently learned from the 2010-2011 earthquakes, the effects can be with those affected for years if not for the rest of their lives and take a variety of emotional forms. These effects also emulate rivers that sometimes flow on the surface, and at other times underground, but still make their presence felt in terms of emotional, mental, and physical health and wellbeing. So the kindness and compassion and support the Prime Minister talked about will not be required of our NZ and Christchurch communities only in the immediacy of now, but well into the future. But in terms of what matters most right now, it has to be about keeping our aroha centered on those most directly affected: the dead, the wounded, the uninjured survivors, the families, their friends, and the wider Muslim community. And about keeping their trauma and loss at the forefront of our hearts and minds, not only now but into the future. But there may be more. This is a wonderful post, Helen. I couldn’t agree more with every single word. Thank you, Wen. It’s been great seeing your tweets, too. We must be compassionate, but we must also be brave, and make sure that we honour the dead by building a truly inclusive society. I believe that we can do this. I believe we can, too, Andrew, but it won’t necessarily be easy and it’s not something we can hand over to others to do for us. I am posting in support of the sentiments as expressed in this blog post. I live in NZ but not Christchurch, and people around me are pretty horrified and sadden at what has occurred. Thank-you for writing what I am sure was a very difficult blog post, but it does articulates what many of us (who don’t have the writing skills) are feeling right now. June, it was very hard to write. But thank you for commenting and I’m glad that it struck a chord, because trying to connect and awhi each other matters at this time. Thank you for your words and actions – however small they seem to you. I admire your government’s resolve to take actions. I can only wish our politicians here in the US were as resolute. I hate our current administration and whatever “inspirational” role his hate played in this tragedy. Keep sending out that light into the universe!